Do you have a dog that drags you around everywhere you go? Are you the last thing your dog even thinks about paying attention to when you go for your daily walks? For some owners, mastering the art of a loose-leash walk is sometimes the most daunting of tasks, but if you follow these few quick tips you’ll be well on your way to a great walking partner! First, consider your dog’s clothing. If your dog is choking or gagging on his regular collar, flying on his back 2 feet everywhere you go or lunging at things a lot on your walk, I would suggest getting the pressure off of their neck and use items that help you have better control such as a No-Pull harness (Freedom, Halti and Easy Walk are a few brands) or a Gentle Leader. Also, stay away from items such as retractable leashes, since we want to teach the dog to stay close to us in the beginning, a retractable leash would really work against you. I go first, you go second. Teach your dog to wait before you go in or out of entry ways of any kind such as doors, aisle ways in stores or crossing the street. This is helpful, not only for loose-leash walking skills but also to help combat bad habits such as shooting out of doorways. Reward your dog for a loose leash. This starts with a very simple practice. Start in a minimally distracting area. Throw a treat out so your dog goes pulling for it (of, course no need to throw the treat if they have found something else to pull for!). As soon as he starts to return and the leash goes loose, use a marker word such as “Yes” or use a clicker and reward the dog with a treat. Do this repetitively during practice sessions until the dog understands that he is getting a treat for the leash being loose and he/she is choosing to stay close to you. Teach your dog they are rewarded for staying by your side. For this, I like to teach my dogs a Nose Touch cue. Put your hand by the side you want your dog to walk on. Click (or mark with YES) and treat a few times for your dog standing in the correct position for walking next to you. Walk forward a couple steps with your hand by your leg again. When the dog comes up to touch your hand, Click and Treat again. Keep repeating this. When your dog touches your hand walk two steps in another direction and reward for the touch. Keep playing until he/she is reliably seeking out your hand. Then try to add more difficulty such as additional steps or changes in speed or direction. Engage with your dog! Treats are one thing, but your constant praise and acknowledgement that they are doing the right thing is even more important in the long run. When some people walk their dogs they barely make any contact with them at all! I always say I am trying to make myself better than the squirrel! Teach your dog pay attention cues, sing to them, whistle, dance, make silly noises in the beginning…try to make yourself more interesting than whatever they think is better than you. Their focus on you is the key to them having a great walk down the road, so make the process fun and interesting! Enroll in a Positive Reinforcement Training Class! In training classes you not only teach your dog loose-leash walking commands and the more stringent heel, but you also teach your dog around a variety of distractions such as other people, dogs, noises, smells, etc. and let’s face it, distractions are the name of the game when you are teaching your dog to walk on a leash. Make sure you work with a force-free, positive reinforcement based trainer who is focusing on teaching your dog the right thing to do, as opposed to focusing on leash corrections such as checks, yanks, pops, etc. In training classes you play games to make the process a little more fun and put and your dog in real world situations. Just following these basic steps will get you well on your way to a fantastic walk. Practice for short periods every day (I do 3-5 minutes), use stinky high value treats in the beginning that your dog is really willing to work for and, of course, have fun!! 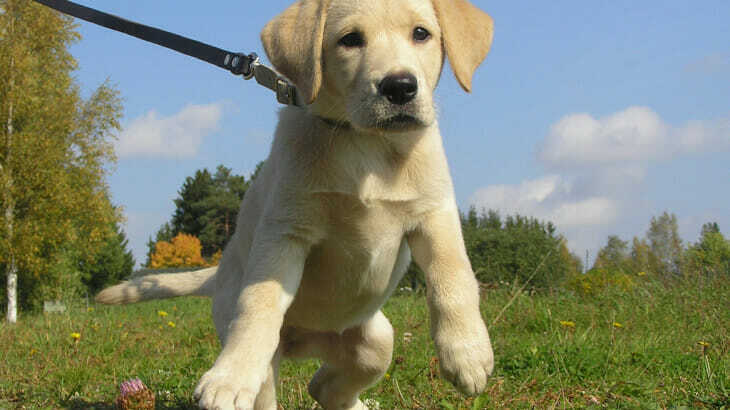 Tricks and Tips dog training, force-free, loose leash, positive reinforcement, pulling, walking. permalink.